Carla Courtney received her Bachelor of Arts degree in Mass Communication and Broadcast Journalism in 1993 from Louisiana State University and her Juris Doctorate degree in 1997 from the Paul M. Hebert Law Center at Louisiana State University. While completing her bachelor’s degree, Ms. Courtney did an internship with WJBO - 1150 A.M. in Baton Rouge, Louisiana. Before entering law school, she was hired as a reporter and videographer for WAFB - TV, Channel 9. During the same time, she was also a radio show host on WJBO - 1150 A.M. and a disc jockey/radio personality on WFMF - 102.5 F.M., Baton Rouge, Louisiana. 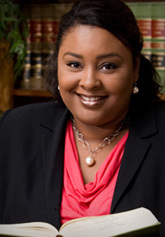 Ms. Courtney began her legal career in 1997 as a staff attorney with the Louisiana Board of Ethics. In 2000, she began practicing law in the private sector concentrating on Environmental Law, Insurance Defense, Personal Injury, and Class Action Administration. She is a litigator in both State and Federal Court with considerable trial experience. Her practice concentrates mainly on Insurance Defense, Personal Injury, Risk Management, Ethics Law, Employment Law, and Education Law issues. Ms. Courtney is a member of the Baton Rouge Bar Association, Louisiana State Bar Association, National Bar Association, the Louis A. Martinet Society, the Louisiana Association of Defense Counsel, the National School Boards Association Council of School Attorneys, the Louisiana School Attorneys Association, the Defense Research Institute (DRI - the voice of the defense), among others. She is admitted to practice before all Louisiana Courts, both State and Federal. She is also admitted to practice in the U. S. Fifth Circuit Court of Appeals and the United States Supreme Court. Ms. Courtney has also been appointed by local courts to act as the Special Master and Assistant to the Special Master in various Class Action lawsuits. Ms. Courtney has been selected to "The National Black Lawyers - Top 100" list each year since 2015, and has also been named to the "Lawyers of Distinction for Insurance Law".